I've really grown to like my AI M-65, both for its versatility and its good looks. After the alterations it can still house even some thick knitwear comfortably, and I've found it to be quite alright at around zero degrees Celsius. These pictures were taken maybe a month ago though, when it was still a fair bit warmer. 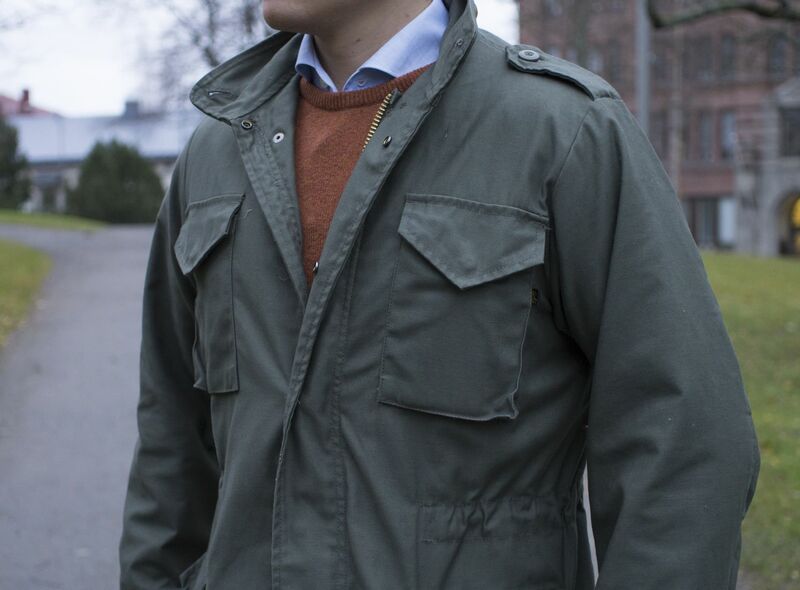 The rush-colored Berg & Berg sweater compliments the olive jacket rather nicely, making them a combination I've worn quite often. 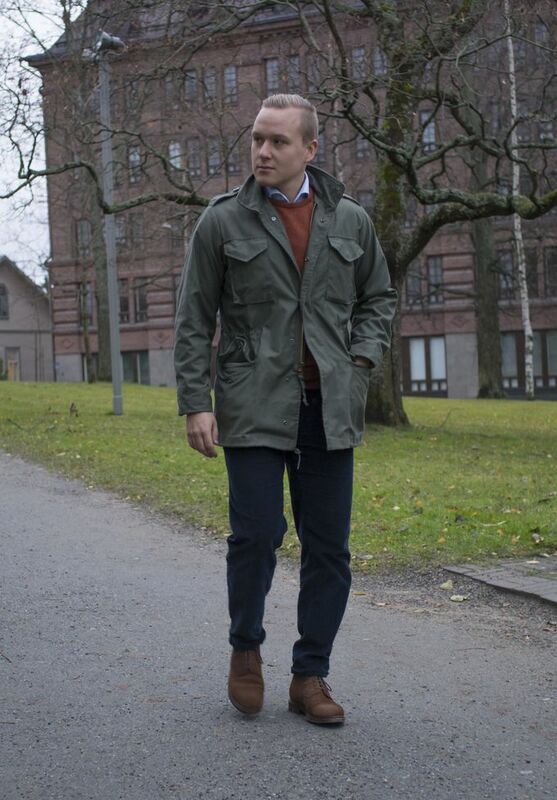 The jacket is from Alpha Industries (although modded heavily), washed shirt from SuitSupply, sweater from Berg & Berg, belt from Alden, corduroy trousers from Polo Ralph Lauren, socks from Falke and boots from Meermin (can be seen in more detail here). The amount of pockets in different kind of field jackets is also pretty handy, something you come to appreciate in everyday life. 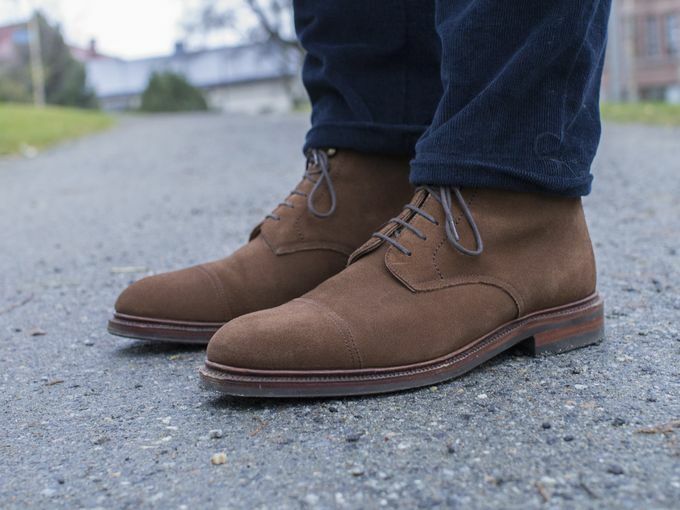 Meermin snuff suede derby boots, paired with navy cords. Some dark brown somewhat worn cords would've been pretty cool here. Tomorrow or Wednesday, depending on how much free time I'll have, there'll be an extensive winter coat post. If you're feeling the cold and are maybe looking for a new coat I suggest you check it out.